Dharmi Gohil shared a screen shot with me on Twitter of a new type of feedback box in the Google search results. This was not about rating how happy you were with the search results but asking about someone's trip to a hotel. 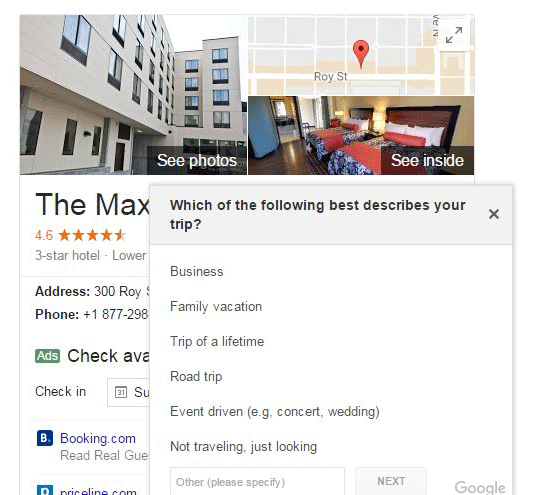 The query was [the maxwell hotel] and near the local box on the right, was a pop up feedback box asking "which of the following best describes your trip?" It knows she went on a trip? It then gives these answers, business, family vacation, trip of a lifetime, road trip, event driven, not traveling just looking and other.